Just when I think I’m developing a sensory disorder in my old age, what with all the screaming and running around and jumping off of things that comes with three boys, the weather gets a bit sunnier and Outside becomes part of our world again. I can see them swinging and playing in the dirt out there, but I can’t hear them. Peace and quiet. It cracked them up to no end, seeing a little three year old make fun of his toadish mother. They don’t live with me, they don’t know the truly hilarious things. They don’t know what I suffer. It’s not a wonder that I lose my voice every day, reading Squirrel Nutkin to a 3 year old. That’s the worst story. It’s so long and you go through all that just to expose your children in the end to a Squirrel who is almost skinned and then his tail breaks in half. I knew reading that dang story was going to make me hoarse, and I knew the tragic ending. I still read it, because certain three year olds love to tease, much like Squirrel Nutkin. They don’t make morals like they used to, and even though he doesn’t have a tail, I hope the story instilled a bit of caution into the little guy. Perhaps he’ll think twice before he calls me “Mama Goo Goo Winkie Head”. Although I might be sad about it. It’s funny how the things your children do to drive you crazy are also very endearing. I mean, Shel is a good little friend, full of conversation and giggles. What shall I do with myself when he’s gone to school? It’s like the weather. I said it’s gotten to be more pleasant, and we’ve had some 70 degree days. The other day I purchased a rather large rabbit with a paper collar to put on my mantle. I knew I would get some flack for it, but it’s SPRING! BUNNIES! EASTER! ETC! Derrick was less than impressed by the big bunny, but Tobin likes it and I like it, and I purchased some Cadbury eggs to soothe Derrick’s frugal, bunny hating soul. The point is, I started to expect Spring, what with the groundhog and the weather and the 15 inch white rabbit with a paper collar. Imagine my surprise when the very day I got that bunny and simultaneously pinned about 80 different Easter decorations on Pinterest, we had to build a fire in the evening. At first I was rather annoyed at the bunny betrayal brought on by frost, but I flopped on the couch, mute, as I am every evening, and warmed my toes. It wasn’t my ideal but it wasn’t so bad. In fact, it was sort of nice. This is my wordy way of saying, “Nothing’s perfect and THANK GOODNESS”. If things were perfect we wouldn’t need morals that involve broken squirrel tails, or three year olds in general, or Bunnies in February. Sure, I can’t talk. I may feel like a walking infection. I have a VIRUS IN MY EYE. My children may be exhausting and loud and currently playing “POWER TERMITE ATTACK” in the backyard, but if I’m honest? I love every minute of it. Even the minutes when I’m blowing my nose. Maybe because I get to use this beauty. Thanks Dad, for this thoughtful Christmas present. You make me laugh. I am pretending it's Spring too. I'll have the house decked out by Saturday. I just has to happen. I wish you were here to help me figure out to do with my vintage Easter cut-outs. I bought them for the windows, but they're too big for the panes, and the log walls cause all sorts of trouble. I'm thinking of a banner, maybe? but need ribbon. I hate Squirrel Nutkin, too. I'd make my husband read that one to the kids. This does get me in the spring mood. We had snow over the weekend so it's time! I hope you feel better soon. I love that they wanted to order for you. JDaniel might have been to shy to order. As always, your words speak to me. Even when you can't talk. 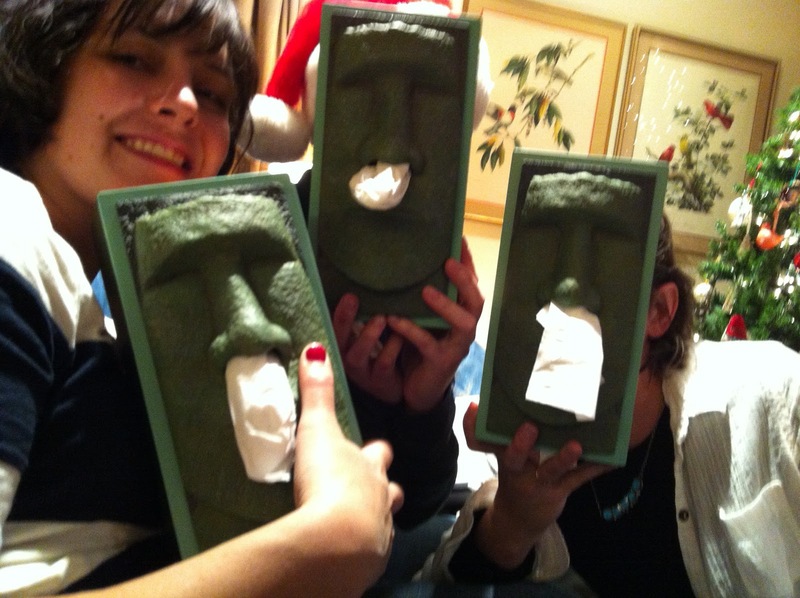 But now, I really really need one of those tissue dispensers. A world without 3 year olds would be a sad world indeed! I get so excited when I see a new posting by you. Your words lift me up and outta my sorry-winter-weary self. And now, you've got me hoping rarin' for Spring, too! My 3 year old always yells “caramel machiatto!” at the Starbucks window. He knows my order OR he wants one for himself. Probably both. Oh, how I wish I could send my boys out to play – but we have ice NOT snow, ICE – in our backyard. Spring, come soon. Also – learning about my kids' sensory issues have made me realize how many I have had all. my. life. I'm really glad you're still blogging. You are hilarious. So are your kids. And yeah, it's totally spring here in stupid Texas. Don't tell anyone I said that.